Whether from stress, watching your favorite team lose the most important game of the year, or handing the car keys over to your teenage son, people grind their teeth for a variety of reasons. Regular teeth grinding can cause serious damage to your teeth and overall oral health. At Slater Family Dental, a Beaverton family dentist of choice, we can help! Even though stress and anxiety can cause teeth grinding, the condition most frequently occurs while you sleep due to crooked or missing teeth or an abnormal bite. Because tooth grinding occurs during sleep, the majority of people never realize they have the condition. The most common symptom of the condition, and telltale sign that you may have a problem, is a sore jaw or a persistent headache. However, even these signs often go overlook, as the most frequent way most people learn they grind their teeth is from a significant other who overhears them grinding at night. If you suspect that you grind your teeth, schedule an appointment with a dentist. Your dentist can examine the jaw and mouth for signs of teeth grinding, which include tenderness of the jaw and tooth abnormalities. 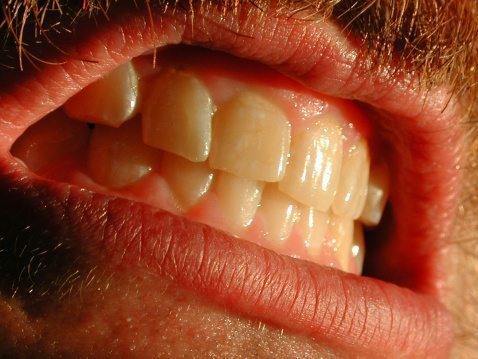 In cases of prolonged teeth grinding, the habit can cause loosening, fracturing, or even tooth loss. Frequent grinding may cause you to wear teeth down into stumps. If this occurs, implants, root canals, crowns, bridges, partial dentures, and possibly complete dentures may be required to repair your oral health. Prolonged bruxism not only damages the health of your teeth, it can also negatively impact your jaws, lead to partial hearing loss, cause TMJ, and even alter the appearance of your face. If your dentist determines that you predominantly grind your teeth at night, he or she can fit you with a mouth guard to wear while sleeping. If stress is the primary cause of your bruxism, talk to your dentist for suggestions about ways to lower your stress levels. Prescription muscle relaxants, physical therapy, starting an exercise program, and beginning counseling are all potential options that may help curb your unconscious habit. Reduce your daily caffeine consumption. This means reducing the amount of soda, coffee, tea, energy drinks, and chocolate you consume daily. Avoid drinking alcohol prior to bedtime. Studies have shown that alcohol consumption increases peoples’ tendency to grind their teeth. Do not bite or chew on anything that isn’t edible, such as paper clips, pencils, or gum. These habits cause your jaw muscles to become more accustomed to clenching, making it more likely you’ll grind your teeth at night. Teach yourself to avoid grinding or clenching your teeth. When you notice yourself grinding or clenching your teeth during the day, place the tip of your tongue between your front teeth. This helps train your jaw muscles to relax. Press a warm washcloth against your cheek near the earlobe at night prior to heading off to bed. This will help relax your jaw muscles prior to falling asleep, making overnight grinding less likely.